Interstate 43 connects the Milwaukee area with Beloit to the southwest and Green Bay to the north. Following the Rock Freeway, I-43 originates at I-39 & 90 and angles northeast from Beloit to Delavan, Elkhorn, Mukwonago and the southwestern Milwaukee suburbs. Once at the Hale Interchange with Interstates 41 and 894 in Greenfield, I-43 joins the Airport Freeway east to south Milwaukee and the Airport Interchange with I-94. Combining with Interstate 94 (North South Freeway), I-43 turns north through the Saveland Park and Walker’s Point neighborhoods of Milwaukee to the Marquette Interchange with the East West Freeway. There I-94 turns west through Menomonee River Valley while I-794 spurs east to Downtown and the Historic Third Ward. Interstate 43 meanwhile remains along the North South Freeway to Kilbourn Town, Harambee and an exit of Milwaukee at Grover Heights. The urban style freeway of I-43 advances north through Glendale along an expressway originally built for U.S. 141. Continuing through the northern suburb villages of Fox Point, River Hills and Bayside, Interstate 43 leaves the Milwaukee area for Saukville and the split with Wis 57. There the freeway turns east by Port Washington to run along the west shore of Lake Michigan to Sheboygan and Manitowoc. 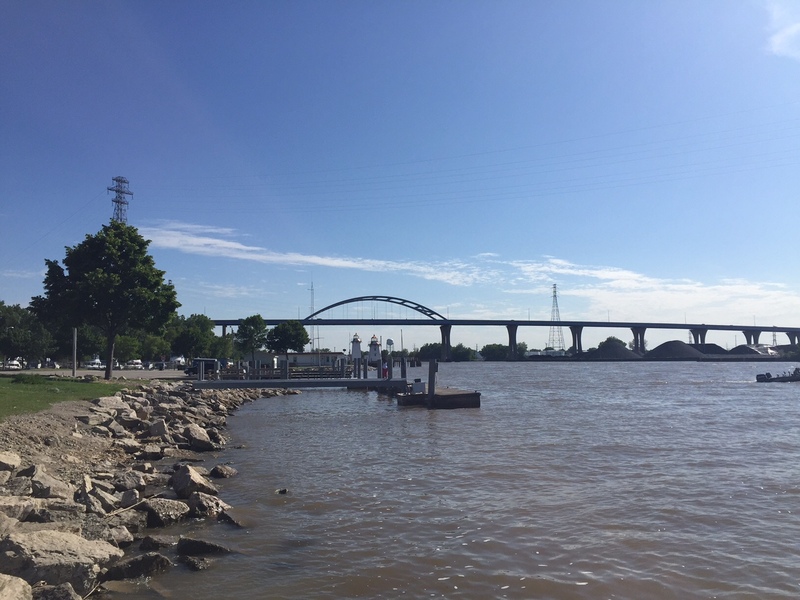 View of Leo Frigo Bridge from mouth of Fox River Photo taken by Peter Johnson (06/17/15). The rural freeway veers away from the lake through northern Manitowoc County to enter Brown County and the Green Bay metropolitan area. Once at Bellevue, I-43 curves northeast than west as part a belt route with Wis 172 and I-41 encircling Green Bay. The final stretch traverses industrial and wetland areas along the southern periphery of Green Bay itself, including the high level Leo Frigo Bridge across the Fox River. 1003-10-79 – I-43 Interchange Off Alignment – Summer 2018 to Fall 2019. 1003-10-80 – I-43 Interchange and Mainline Reconstruction – Summer 2019 to Fall 2021. 1003-11-71 – I-39/90 and I-43 Mainline Reconstruction – Summer 2018 to Fall 2019. Interstate 43 replaced U.S. 141 between Milwaukee and Green Bay. The route also doubles as U.S. 41 along the east-west leg of Interstates 894 and 41 in Milwaukee. 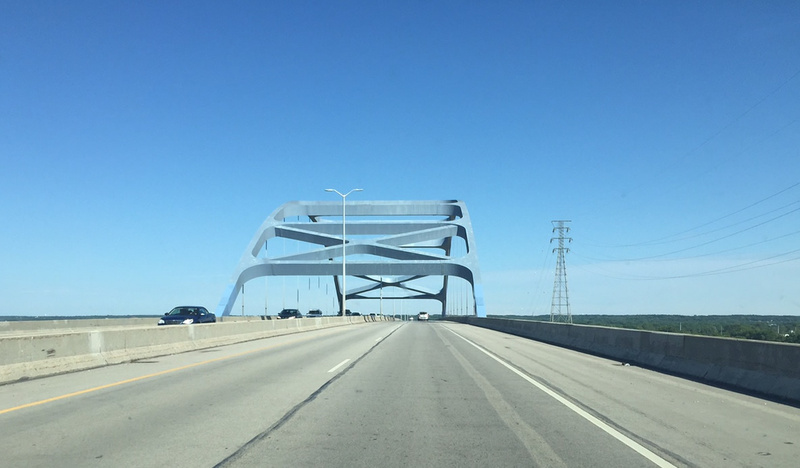 Further south, what was originally designated as Wis 15 (via the Rock Freeway, which connected Beloit with Milwaukee) began construction in 1969 and was completed in 1976. Approximately ten years later on November 24, 1987, the highway was added to Interstate 43. With this action, I-43 gained 72 miles to the southwest along Wis 15 (Rock Freeway) to Interstate 90 near the state line.1 STH-15 was decommissioned by this action. With the extension of Interstate 39 into Wisconsin on October 16, 1992, I-43 connected to I-39. Signs for Interstate 39 were mostly erected around 1996. For more information, visit Chris Bessert’s Wisconsin Highways: Interstate 43 page. 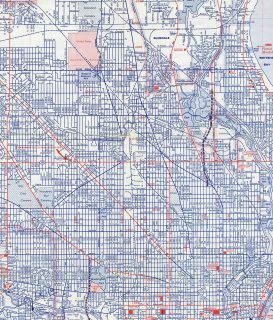 This page also includes a discussion of the proposed location of the “Milwaukee to Green Bay Interstate Highway,” including consideration for what is now Interstate 41 as a candidate for the path of I-43 in the early planning stages. I-43 south approaching the top of Leo Frigo Bridge in Green Bay. Photo taken by Peter Johnson (06/17/15). Looking west from the Ken Euers Nature Area at the interchange between Interstates 41, 43 and U.S. 41 and 141. Photo taken by Peter Johnson (10/22/15). The ramps from I-41 south to I-43 south and I-43 south to I-41 south closed on October 23, 2015. The last phase of the I-41 Project reopened those connections with new ramps in August 2016. 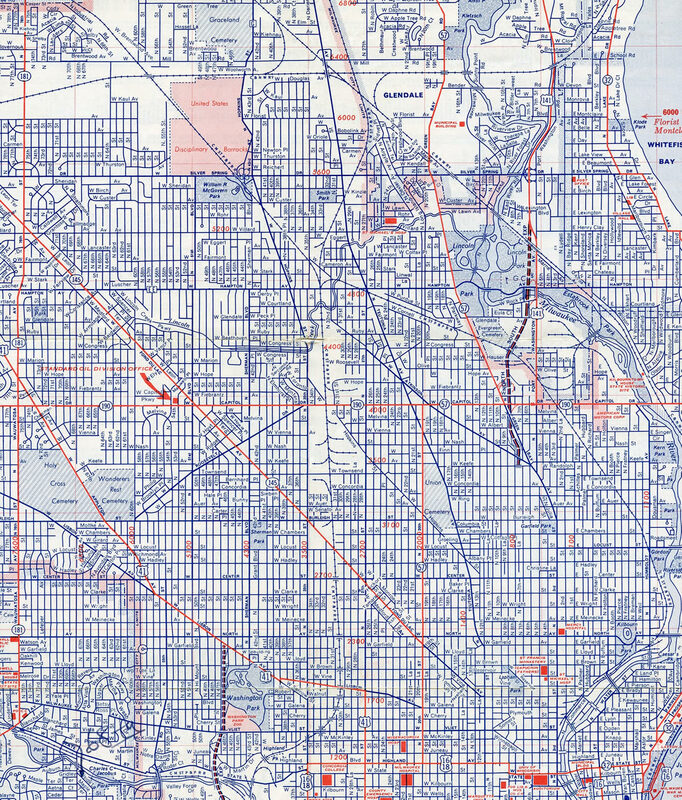 The initial stretch of what would eventually become a part of Interstate 43 appears on this 1962 map of Milwaukee. Interstate 43 debuted on the 1975 edition of the Rand McNally North American Road Atlas. Construction at Interstate 41 modernized and expands the freeway through the Green Bay area as part of the overall US 41 Project through Brown County. Work at the north end of Interstate 43 included an upgrade of the substandard cloverleaf interchange into a high-speed directional T interchange. The southbound beginning of I-43 from I-41 shifted from a tight right side ramp to a new directional ramp departing from the left. Work also separated movements at the adjacent diamond interchange with U.S. 141 and County HS (Velp Avenue). Construction commenced in September 2013, with the interchange at I-41 and U.S. 141 opened to traffic on August 26, 2016. The Leo Frigo Memorial (Tower Drive) Bridge4 accommodates larger ships on the Fox River with a navigational clearance of approximately 120 feet. The tied arch bridge affords views of Downtown Green Bay, Lake Michigan / Green Bay and Lambeau Field. Photo taken by Peter Johnson (08/30/16). One mile ahead of Interstate 41 & U.S. 141 (Exits 192A/B) along Interstate 43 north. This guide sign was amended in 2015 to show an I-41 shield in place of a U.S. 41 marker. Photo taken by Peter Johnson (02/02/18). The last confirming marker for Interstate 43 north stands beyond the entrance ramp from Atkinson Avenue. Photo taken by Peter Johnson (02/02/18). The I-43 mainline defaults onto the U.S. 41 & 141 freeway (Exit 192A) north to Abrams. U.S. 141 travels to Iron Mountain, Michigan, while U.S. 41 follows the shoreline of Green Bay to Marinette and Menominee, Michigan. Photo taken by Peter Johnson (02/02/18). The freeway expands to four northbound lanes ahead of the ramp split for Interstate 41 and U.S. 41-141. Photo taken by Peter Johnson (02/02/18). End signage for Interstate 43 was installed during September 2015. Photo taken by Peter Johnson (02/02/18). Interstate 41 runs south from Ashwaubenon to Appleton. Connections with the Wis 29 & 32 expressway in Green Bay lead motorists northwest to Shawano. References for Wis 29 at Exit 192B were added during 2016 work to revamp the interchange. Photo taken by Peter Johnson (02/02/18). The highest point of the directional T interchange is the flyover connecting with I-41 southbound. The upgraded exchange replaced a folded diamond interchange. Photo taken by Peter Johnson (02/02/18). One mile ahead of then U.S. 41 & 141 (Exits 192A/B) on I-43 north near Ken Euers Nature Area. Photo taken by Chris Lokken and Sage Sulenta (04/14/07). Sign bridge located by the Military Avenue overpass on I-43 north. One lane was allocated for each direction of U.S. 41-141. U.S. 141 south was omitted from overhead for Exit 192B, due to U.S. 141 south exiting almost immediately after Interstate 43’s northern terminus. Photo taken by Chris Lokken and Sage Sulenta (04/14/07). A pair of end shields for Interstate 43 were posted just beyond the Military Avenue overpass. Photo taken by Chris Lokken and Sage Sulenta (04/14/07). This scene is now where the southbound flyover to Interstate 41 & U.S. 41-141 departs. Photo taken by Jeff Royston (10/00). Traffic for U.S. 41 and U.S. 141 north to Marinette and Iron Mountain, Michigan departed at Exit 192A. Photo taken 08/12/09. Continuing on the sharp ramp to U.S. 41 and U.S. 141 south was this reassurance shield assembly (similar to how IowaDOT signs Interstate to Interstate connections). A new flyover replaced the movement on August 26, 2016. Photo taken by Chris Lokken and Sage Sulenta (04/14/07). The tight loop ramp from Interstate 43 north to U.S. 41-141 south closed permanently in October 2015 as part of a project to rebuild the southbound lanes of Interstate 41. Photo taken by Chris Lokken and Sage Sulenta (04/14/07). Interstate 41 begins along the U.S. 41-141 freeway south from Lineville Road (CTH-M). The systems interchange with Interstate 43 follows in one mile. Photo taken by Peter Johnson (10/28/16). I-41 expands to five southbound lanes auxiliary lanes open for Interstate 43 south. 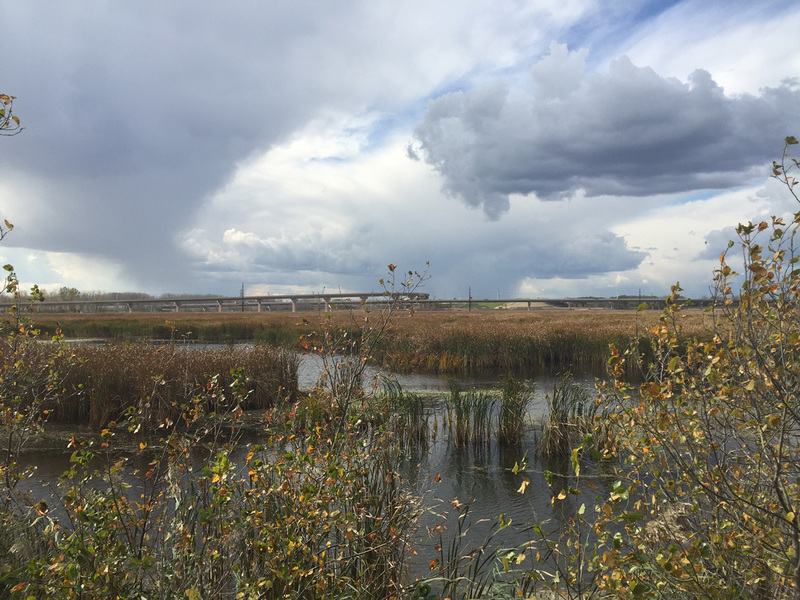 A left exit for I-43 was chosen because of the wetlands and tight space between the freeway and adjacent Velp Avenue. Milwaukee is the control city because I-43 is a shorter route to Wisconsin’s largest city than I-41 at this point. Photo taken by Peter Johnson (06/14/18). U.S. 141 separates from I-41 & U.S. 41 to the immediate south of Interstate 43 to join Velp Avenue east to Downtown Green Bay. I-43 runs just north of the city center across the Leo Frio Memorial Bridge. Photo taken by Peter Johnson (06/14/18). The high-speed ramp to Interstate 43 south does not have any advisory speed so traffic can safely exit at 70 miles per hour. Interstate 43 forms the north and east legs of the Green Bay Beltway. U.S. 141 departs I-41 at the succeeding ramp to the right and joins Velp Avenue east toward Downtown Green Bay. Photo taken by Peter Johnson (06/14/18). One mile north of Interstate 43 south along U.S. 41-141 southbound. Interstate 43 serves the immediate waterfront area of Green Bay before encircling the east side, while Interstate 41 & U.S. 41 stays on the west side of the city. Photo taken 05/30/11. Traffic departed U.S. 41 & 141 for the southbound beginning of Interstate 43 at Exit 171. The previous exchange between the two freeways was similar to a folded diamond interchange, with low speed ramps. I-41 & U.S. 41 connects Green Bay with the Fox Valley Cities of Appleton and Oshkosh while I-43 heads southeast to Sheboygan and Manitowoc. Photo taken 05/30/11. Interstate 41 turns northeasterly from Green Bay into the village of Howard on the approach to U.S. 141 and CTH-HS (Velp Avenue) and I-43 south. Completed in December 2016, the systems interchange at Exit 170 utilizes a distributor roadway northbound for both Velp Avenue and Interstate 43 south. Photo taken by Peter Johnson (06/14/18). Two lanes separate from the Interstate 41 northbound mainline for Exit 170A to U.S. 141 south and CTH-HS in Howard and Interstate 43 south around Green Bay. Photo taken by Peter Johnson (06/14/18). A dumbbell interchange (Exit 170A) joins U.S. 141 north with I-41 north ahead of the directional T interchange (Exit 170B) with Interstate 43 south. Photo taken by Peter Johnson (01/30/18). A reassurance marker for Interstate 43 stands along the flyover ramp (Exit 170B) carrying traffic from Interstate 41 north. This ramp opened on August 27, 2015. Photo taken by Peter Johnson (11/03/15). Traveling north on U.S. 41 across Velp Avenue, a half mile ahead of the previous interchange (Exit 171) connecting with Interstate 43 south. I-43 serves Downtown Green Bay before reaching Wis 54 and Wis 57, which provide a direct link to Door County. Otherwise, Interstate 43 turns to the south towards Sheboygan and Milwaukee. Photo taken 05/30/11. This sign bridge was located at the split of traffic between U.S. 41 & 141 north and Interstate 43 south. U.S. 41 and U.S. 141 extended north along a freeway from Howard to Abrams before separating to Marinette and Iron Mountain, Michigan respectively. This loop ramp was replaced by a new directional ramp during road work between 2013-16. Photo taken 05/30/11. The first reassurance shield for Interstate 43 south, posted just after the August 28, 2015 opened ramp from I-41 north to I-43 south. Photo taken by Peter Johnson (01/30/18). Crossing over Schroeder Road, travelers along I-43 south see the first guide sign for Exits 1B/A with Interstates 39 and 90. All signage for the full cloverleaf interchange omitted the 1993 extension of I-39 northward into Wisconsin from Rockford, Illinois. Photo taken 05/30/11. Departing from the diamond interchange with Hart Road, Interstate 43 progresses one mile west to Interstates 39 & 90. I-39 & 90 lead south three miles to cross the Illinois state line and north ten miles to Janesville. Photo taken 05/06/10. An end shield precedes the ramp departures for Interstates 39 and 90 and the I-43 transition into Wis 81, a commercial arterial extending west into Beloit. Photo taken 05/06/10. Exit 1B leaves Interstate 43 south for I-39 north & 90 west to Madison. Construction through 2023 upgrades the corridor to six overall lanes. Photo taken 05/06/10. Interstate 43 south reaches the loop ramp (Exit 1A) for I-39 south & 90 east to Rockford, Chicago, Bloomington and Normal. Wis 81 commences a nearly 124-mile route to Wis 133 at Cassville here. Photo taken 05/06/10. Freeway ends signage advised motorists of the pending terminus of Interstate 43. Similar signage was found at the original southern terminus of Interstate 69 at Indianapolis. Photo taken by Chris Lokken and Sage Sulenta (04/14/07). A pair of end shields were posted for Interstate 43 as motorists entered the cloverleaf interchange (Exits 1B/A) with Interstates 39 & 90 and Wis 81 (Milwaukee Road) west. These assemblies were later replaced with a solo set of shields that included I-39. Photo taken by Brian Down (12/02). Wis 81 end shield assembly posted ahead of the arterial transition into Interstate 43. A signalized intersection lies ahead with Ford Drive north and Freeman Parkway south, local roads serving adjacent businesses and subdivisions. Photo taken 05/06/10. Supplemental signs were added to reflect the Interstate 39 extension north from Rockford, Illinois to Wausau, Wisconsin. I-39 combines with I-90 east to the south side of Rockford, where it shifts westward for the eventual pairing with U.S. 51 to Lasalle, Peru and Normal. Photo taken 05/06/10. Heading south from Beloit, Interstates 39 & 90 transition into the tolled Jane Addams Memorial (Northwest) Tollway. The tandem combine with U.S. 51 in six miles and split in 20 miles ahead of U.S. 20. I-90 remains tolled leading southeast to Chicago. Photo taken 05/09/10. A shield assembly references Interstate 39 for the approaching loop ramp (Exit 1B) onto I-39 north & 90 west to Janesville and Madison. Photo taken 05/06/10. Interstates 39 & 90 lead north 45 miles to the capital city of Madison, where I-94 ties in for a three-way overlap to Portage. Photo taken 05/06/10. Millington Road forms a south side frontage road to Interstate 43 as motorists pass by the first northbound reassurance marker. The freeway doubles as an Alternate route for I-39 to Exit 6 with Wis 140. Photo taken 05/06/10. 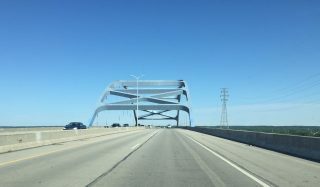 Interstate 39 was finally added to this assembly after 2007, 14 years after the extension north from Rockford, Illinois to Wausau was made official by AASHTO. Photo taken by Chris Lokken and Sage Sulenta (04/14/07). Just beyond the Illinois state line, Interstates 39 north & 90 west travel to within two miles of Interstate 43 and Wis 81. A rest area precedes the cloverleaf interchange. Photo taken 05/06/10. Cranston Road spans Interstates 39 & 90 one mile ahead of Exit 185B for Interstate 43 north. The freeway remains rural as it encircles the eastern outskirts of Beloit. Photo taken 05/06/10. The northbound beginning of Interstate 43 departs I-39 north & 90 west via Exit 185B. I-43 serves the cities of Delavan, Elkhorn, and Waukesha on its northeasterly trek toward Milwaukee. The freeway reaches I-41 & 894 in 60 miles. Photo taken 05/06/10. Forthcoming Exit 185 with Interstate 43 north and Wis 81 south provides the second of two interchanges serving the city of Beloit on I-39 south & 90 east. The full cloverleaf interchange with I-43 north lies one mile south of the Hart Road overpass here. Photo taken 05/06/10. Exit 185A departs I-39 south & 90 west for Wis 81 (Milwaukee Road) west. The Trunk Highway extends west from the ending I-43 toward Downtown Beloit to the straddle southern reaches of Wisconsin westward to Cassville along the Mississippi River. Photo taken 05/06/10. A full guide sign takes the place of a conventional gore point sign as Exit 185B loops away from I-39 south & 90 east for Interstate 43 north. I-43 travels a rural route to Mukwonago, where transitions to a commuter route leading into Milwaukee, 64 miles to the northeast. Photo taken 05/06/10. 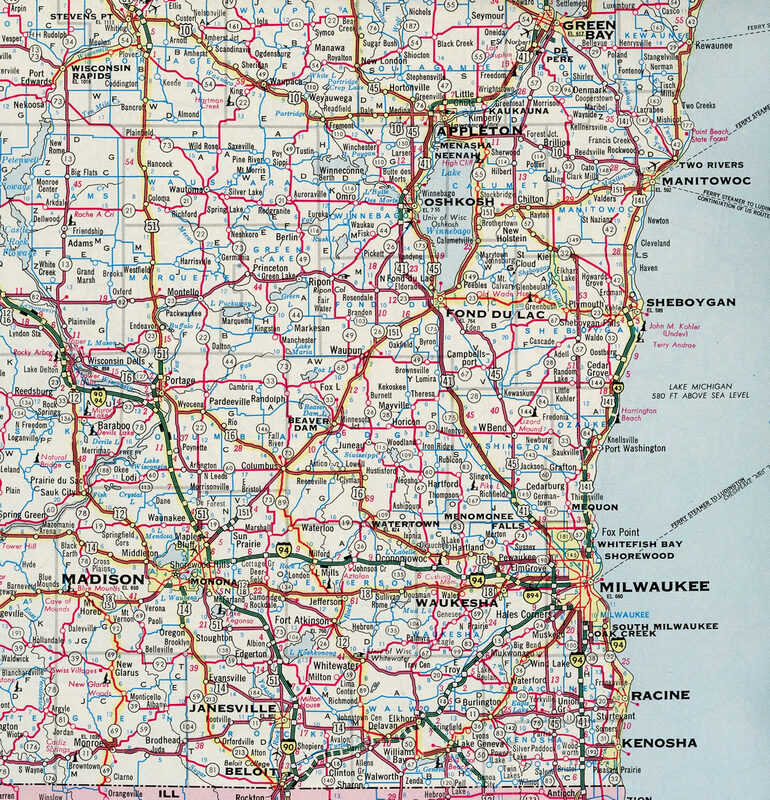 Wisconsin Highways: Highways 40-49, Chris Bessert. “I-57 Fund Extension Appears Probable.” The Milwaukee Journal, October 7, 1972. “Route Approved for I-57.” The Milwaukee Journal, May 18, 1973. “Final investigative report from Leo Frigo Bridge sagging released.” Fox 11 News, May 18, 2015. 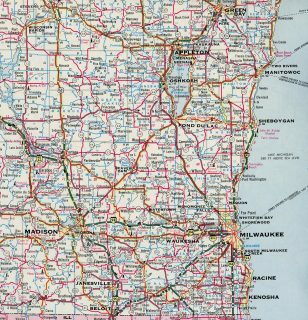 Wisconsin Highways: Highways 140-149, Chris Bessert.